The Most Beautiful Dog Show Leads You Have Ever Seen! Toy and small breeds can now have beaded leads too! Handmade glass beaded dog show leads of the finest quality. Each one is an original work of art. Dog show leads made to truly complement your beautiful show dogs. All beaded leads are made with handcrafted lamp-work glass, Tibetan silver, lead free pewter, gold and silver plate, brass and high quality materials throughout. There are no plastic parts. We will make your beautiful show leads to order! Each lead is a one of a kind work of art, customized just for you and your dog! 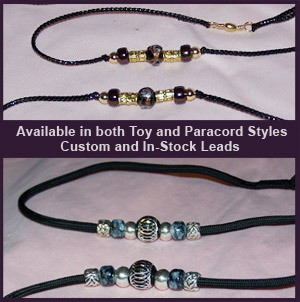 Choose either a Toy or Paracord Lead style and just follow the steps for creating your custom lead. We keep a variety of dog show leads which are ready to ship out when you purchase! Let us know what style of lead you are looking for and your preference as to color family, and we’ll match up bead type, lead color and lead style with our inventory. I bought 3 leads this Sunday and just wanted to tell you everyone I show them to thinks they are beautiful. Going to be hard to keep them hid until Christmas… Pamela L.